Moments in Time: It's a Match! 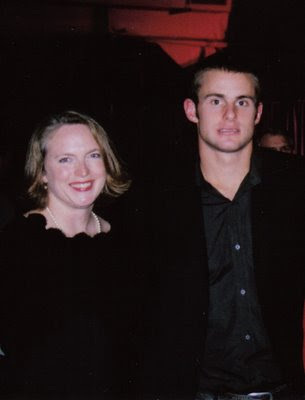 With the Australian Open under way, I couldn't resist posting a photograph taken of Andy Roddick and me at a charity tennis event in 2004. He was in the middle of two phenomenal years. He had just won the U.S. Open in 2003 and was runner-up at Wimbledon in 2004. Now he's made it to the third round of the Australian Open having defeated Xavier Malisse of Belgium on Wednesday. Ranked 9th in the world today, he'll face Frenchman Fabrice Santoro in the next round. But I digress; here he is, with me, at the charity tennis event! Looking at the photograph, you might think I was a little more excited about getting my picture taken with him than he was about getting his picture taken with me. But the camera, you see, just caught him at the wrong moment. I pulled the second photograph off the Australian Open Web site. But a girl can pretend, can't she? Whoo nice pics Roban....both of them! Andy has a really good chance of reaching the finals in the Australian Open. I'm having a lot of sleep deprived nights staying up late and watching the tennis. I see Peg is keeping up with the Open. We love to watch tennis!! Love it! Wow, I don't have my photo taken with anyone famous. I really like Andy (well, not personally...you know what I mean!) I had actually forgotten about the Australian Open until I came across some scores in the paper. Definitely did not have my act together this year! Lucky you. You should scold that photog for not snapping at just the perfect moment of him displaying pure joy! Who wouldn't smile getting their picture taken with you. You're a celebrity to --at least to us. Thanks for the Pen comment. I too love to mark on my students' papers in pretty colors, but that's not writing in my opinion. Roban, I realized that I never got back to you on the wall cling (for the jumping photo). I just ordered another one for my daughter's (10th!!!) b-day, and thought about it. Sorry. We got it from a professional-ish photo site: mpix.com. Check it out, it's a great site. Wow, you are so lucky. I love your photo comparison. You looked great and sounds like it was a great event to be at. Love your sense of humor. Hey, hey, hey! Check that out! Great picture!! I'm back again to comment on the Open. I watched a lot of it when out for my snow day. 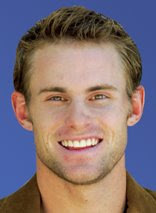 I saw that TV photo of Roddick and smiled as I told my husband of your post. He does look much better with that photo op smile. They have been showing some great video of Melbourne. It is beautiful.